Stand-up paddle boarding (SUP) is a fun and exhilarating way to get some exercise and get out on the water during summer. As a matter of fact, this water sport is great for exercise, sightseeing, and recreational floating. Some people even use it as a platform for fishing or yoga. Before taking to the water, learn about the basic gear, safety precautions, and beginner techniques used by most boarders. 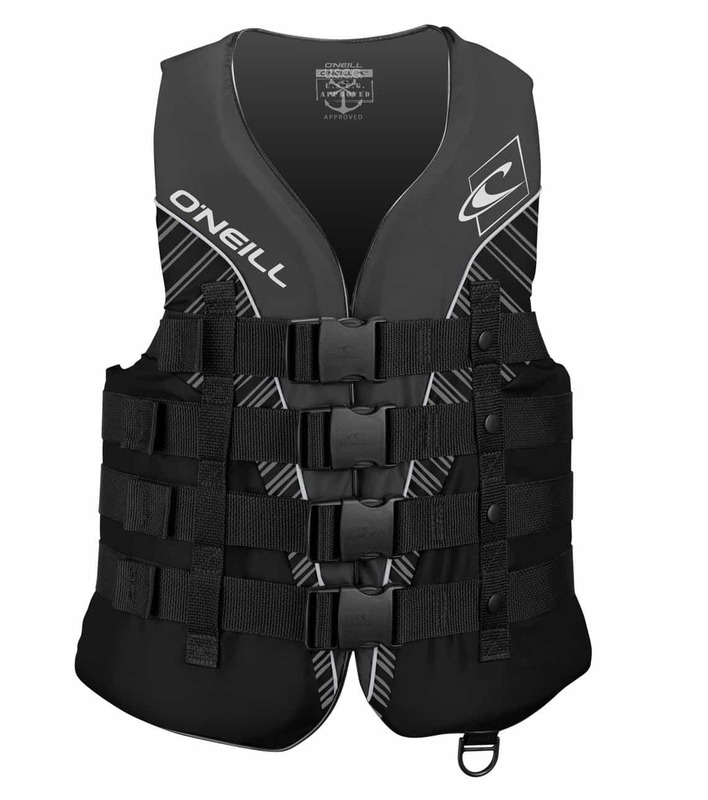 The following section serves as an example of what gear you need when heading out onto the water for the first time. Of course, it is always a good idea to rent or borrow gear before purchasing your own. It’s always a good idea to test a few boards before making a purchase. When selecting a board of your own, it’s important to consider your weight and skill level. Beginner paddle boarders tend to prefer wide, thick, longer boards because they provide a more stable foundation. While competitive boarders often utilize smaller boards because they allow for more speed and agility. 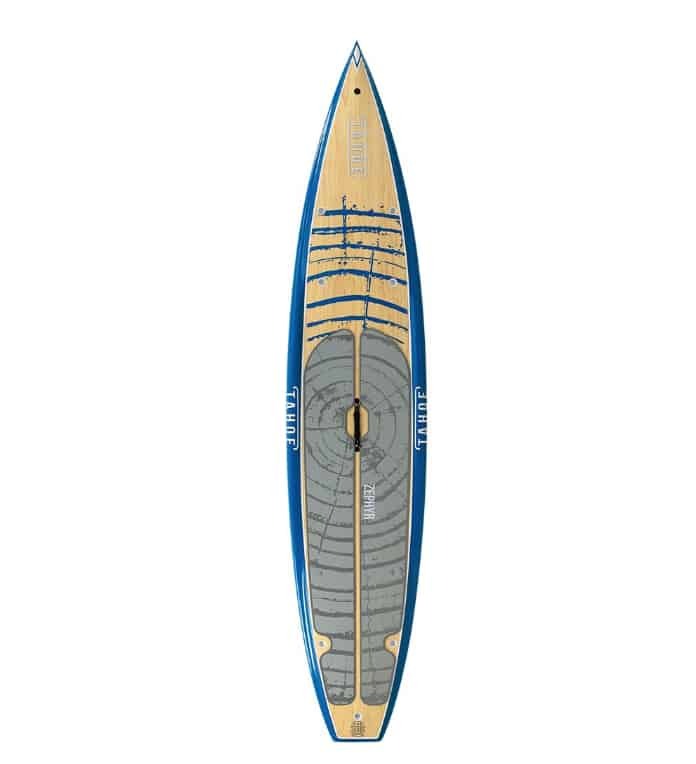 When searching for a paddle board you may notice that there are several different shaped boards. The shape of a paddle board helps to determine whether it is designed for racing, flat boarding, surfing, or general use. Boards either feature a displacement or planing hull. The structure of the hull helps to determine its potential speed and control. 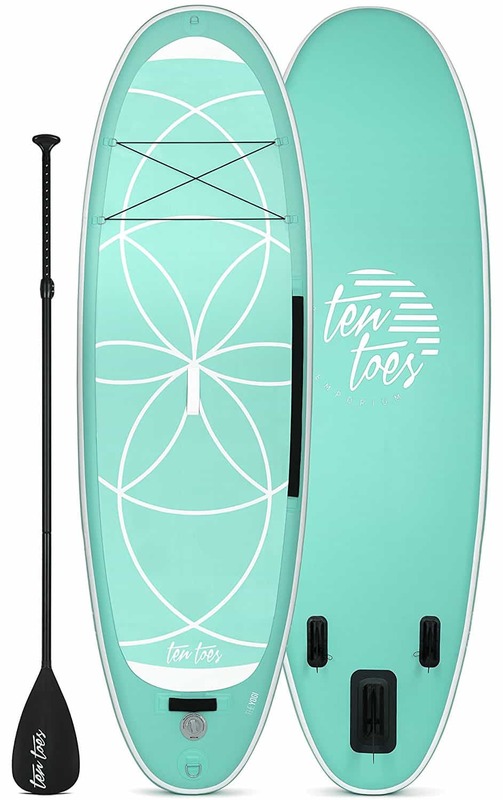 Expect to spend anywhere from $500 to over $1,000 for a well-built SUP board. While this may sound like a steep investment, a well cared for paddle board can last a lifetime. 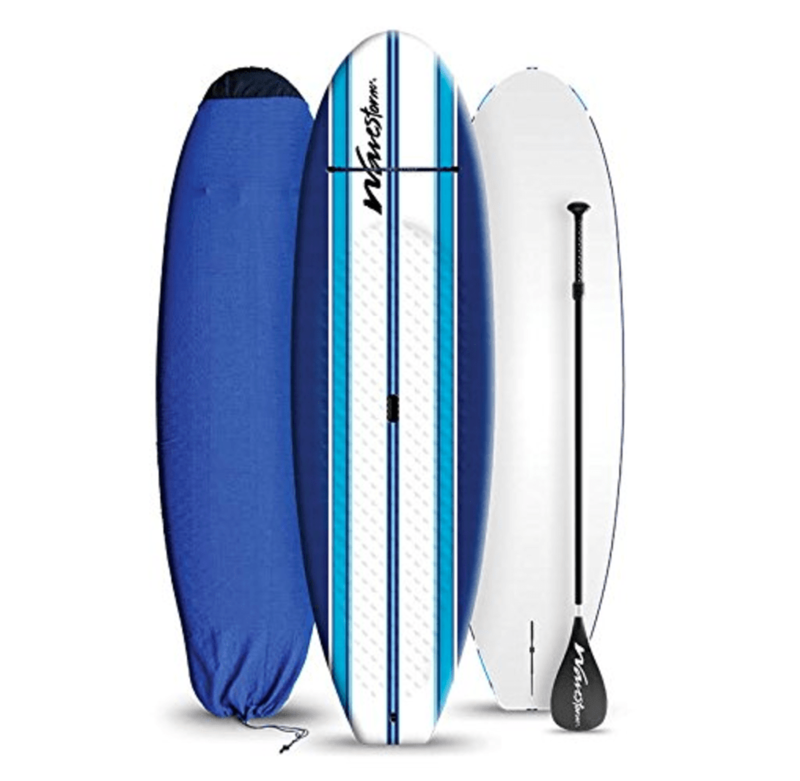 All-around SUPSs: All-around SUP boards are a wide, round shape that is ideal for beginners. They’re great for a variety of conditions and applications. 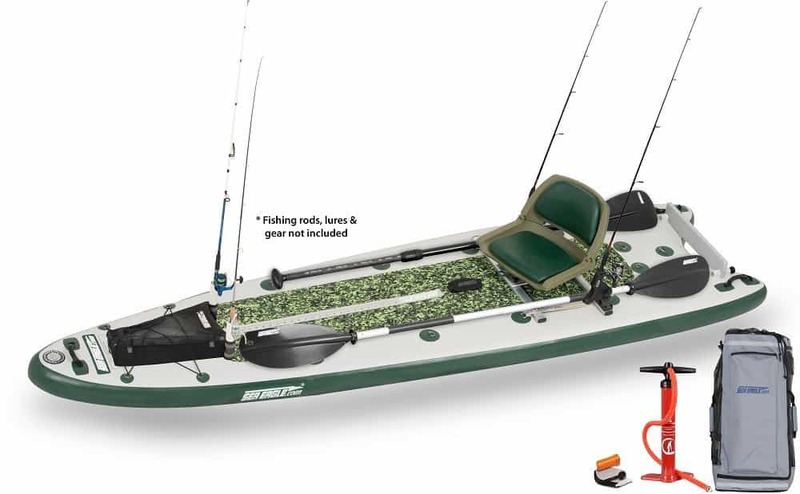 Fishing SUPs: Fishing SUPs are by-far the largest paddle boards. They are essentially a small vessel for a single fisherman. They are a solid foundation for a fisherman, tackle box, pole, rod holder, and anything else you might need to land a ream catch. 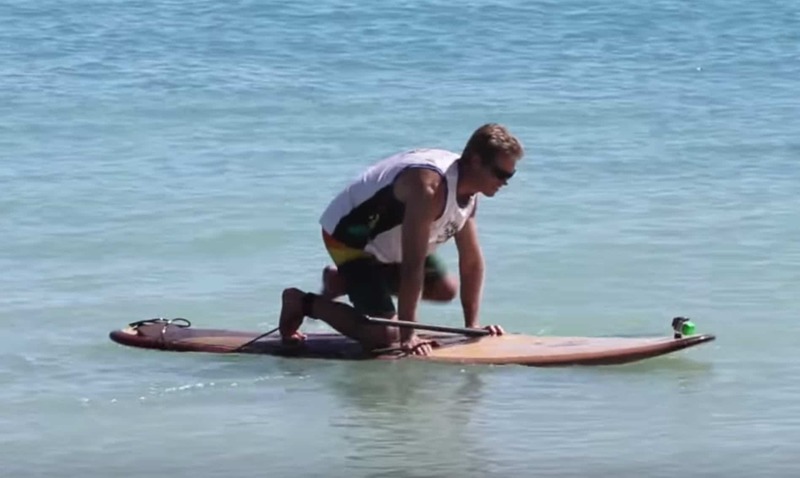 Yoga SUPs: Yoga SUPs are typically a wide platform flat water paddle board. Think you can land that handstand pose while floating? 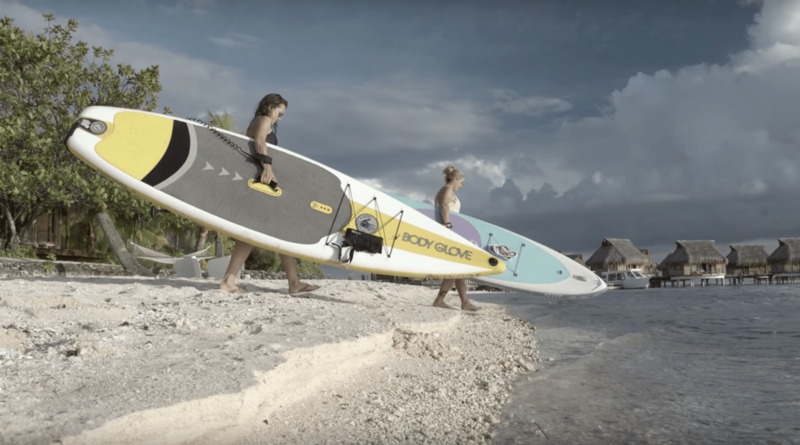 Inflatable SUPs: While epoxy SUPs offer a superior performance, inflatable paddle boards are a great option for individuals who lack storage or transportation options. These are designed for open or flat water paddle boarding. They are usually wider for stability and are designed for maximum glide and to be very efficient. Designed for flat water races, open ocean racing, and down winders. These are longer and narrower for speed and glide which is not ideal for a beginner as you will have less balance. These are for a more advanced SUPer looking for speed and distance. These are designed for smaller to medium sized surf. They tend to be a little smaller to turn and carve easier. These are for beginner to advanced paddle boarders. Designed for the ocean and surf. 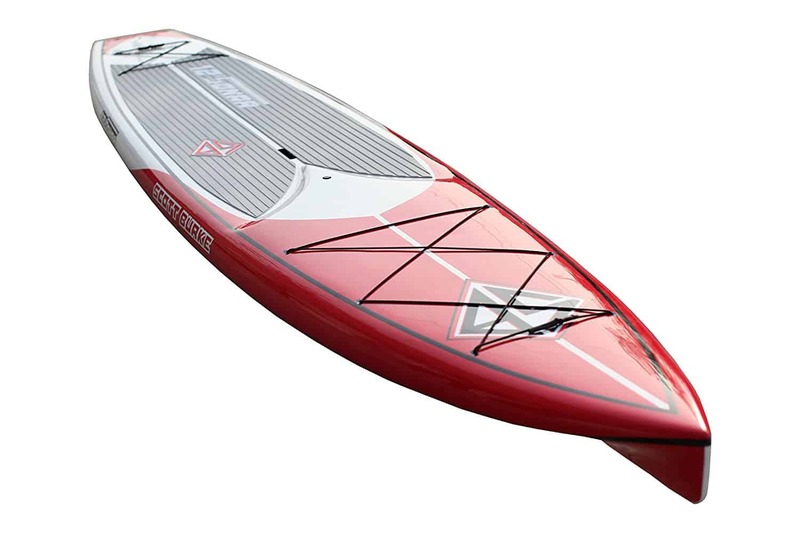 SUP paddles are made from a wide variety of materials, including aluminum, plastic, fiberglass, wood, and carbon fiber. Most boarders prefer the lightest, sturdiest paddle. The lighter a paddle the less fatigue boarder experiences. The last thing to consider before purchasing a paddle is the blade. SUP boarding requires that larger boarders have larger paddle blades. You’ll also need to determine whether you need a teardrop, rectangular, or offset paddle. Each of these variances has an effect on how much power is needed for each paddle, so choose wisely. 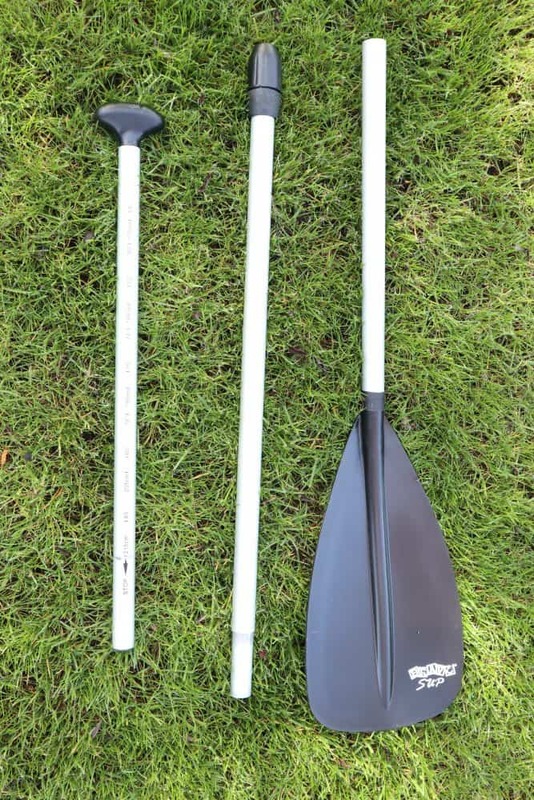 This is a Bravo 3 piece aluminum SUP paddle pictured to the right. The U.S. Coast Guard requires all SUP boarders who travel outside surfing, swimming or bathing areas to have a USCG-approved life jacket. This includes types I, II, III, Type V, and some belt pouch inflatable PFDs. Children under the age of 13 must where there PFD at all times. 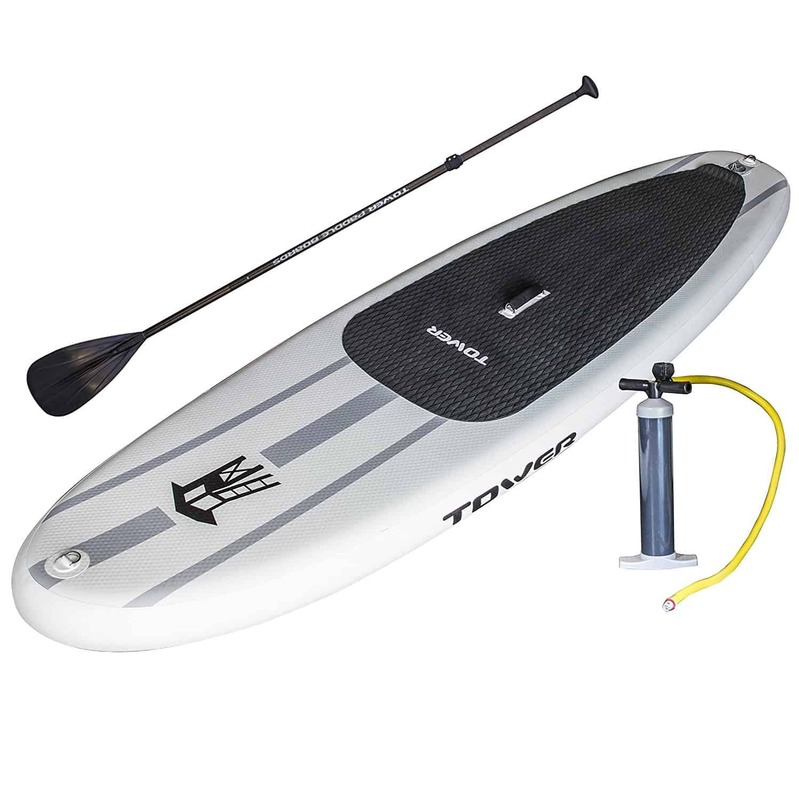 A SUP leash is a tether that connects you to your board at all times. It typically consists of a short cord and an ankle cuff with a Velcro closure. A leash helps you protect your self and your fellow boarders. It’s also a great way to ensure the ocean doesn’t swallow your gear. 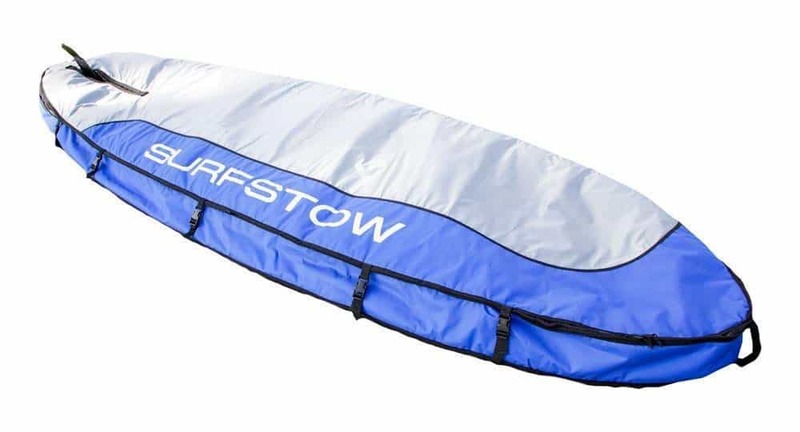 While board bags are an optional piece of equipment, they’re an excellent way to transport your bag while keeping it protected. Note that many manufacturers make bags that are an ideal fit for their own boards. What’s more, most bags are tailored to fit a specific curve and size. There’s no specific SUP uniform. However, most people choose to wear a bathing suit, board shorts, rash guard, or a combination of these clothing when the weather is nice and the water warm enough. Wetsuits of varying thicknesses can also be worn. When spending long hours out on the water, sun protection is imperative. Boarders may choose to wear long-sleeved shirts, waterproof sunhats, sunscreen, and/or sunglasses. The U.S. Coast Guard requires all SUP boarders outside swimming and surfing areas carry a whistle or sound-producing device to warn other vessels of their presence. Likewise, boarders who remain on the water past sunset must carry a flashlight or lighting device to warn other boaters of their presence. Once you’ve made the investment in your own stand-up paddle board equipment, it’s time hone in on transportation. Paddle boards are pretty hefty and that means placing them in the back of a sedan is pretty much out of the question. While a handful of bungees can solve most overhead load problems. However, the following selections include a few more road-friendly transportation options. Cam straps are by far the cheapest and easiest solution to transporting your paddle board. 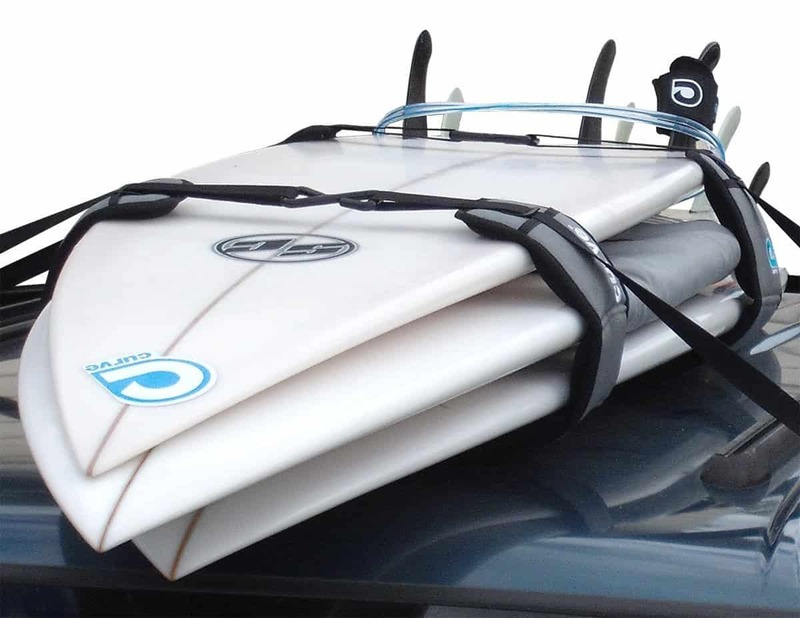 Use two or more cam straps to tightly secure your paddle board to the roof of your car. 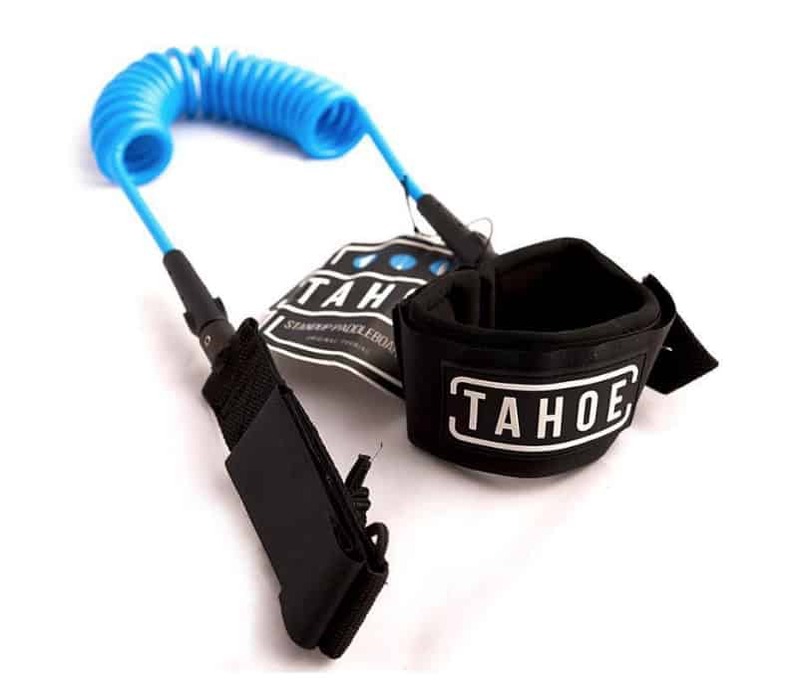 The cam straps should be looped over the bars of a roof rack to ensure your precious cargo does not shift or come loose. Or you can just buy a cam and pad system like the one pictured. 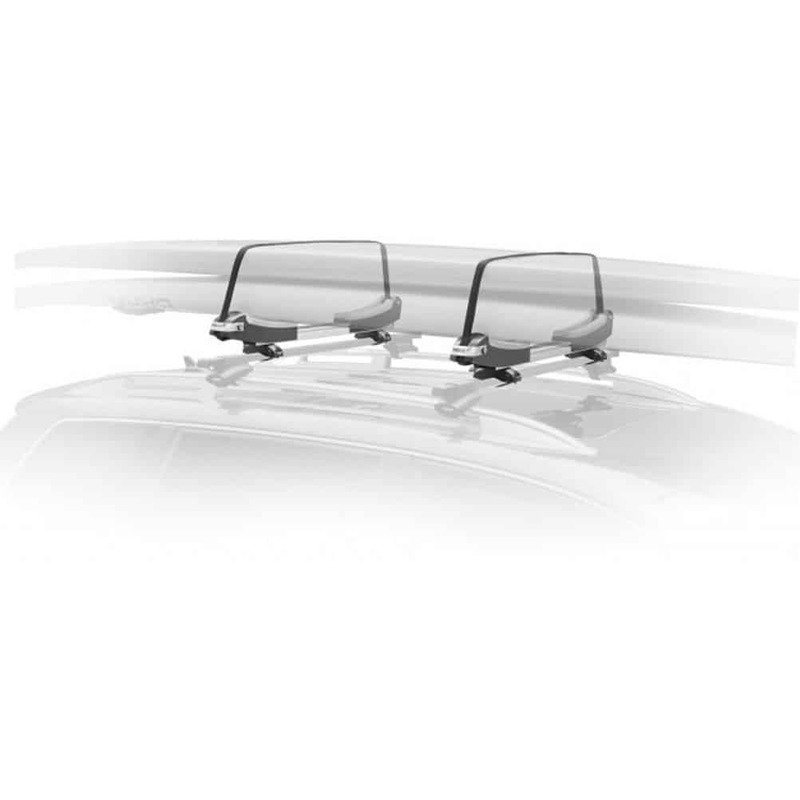 If you plan on making SUP a daily activity, universal SUP car racks provide a consist transportation solution that is designed to specifically hold paddle boards like the Thule car rack system pictured here. While paddle boarding offers the opportunity for an exhilarating full-body workout, it is an accessible sport for people of all ages and fitness levels. Nevertheless, it is important that you establish the skill to stand up and balance on your paddle board before taking it out on excursions. To get started, find a knee-deep (don’t damage your fins by scraping it along the sand!) still body of water where you can practice your standing, balancing, and falling skills. Once you’ve geared up, take your board into the water and center yourself on one side. Place one hand on each side of the board. Your paddle should be resting so that your hands can easily grasp it. Carefully raise one foot and then the other onto your paddle board, allowing your knees to touch the board for extra stability. Once both of your legs are positioned on top of your board, arch your back, push your chest out and slowly lift one leg to transfer your weight to your foot. Take your time before attempting to stabilize your second leg. Ensure that your legs are a shoulder-width apart before straightening your knees. Once your standing, focus on maintaining your balance. Straighten your posture and shift your balance between your feet to compensate for any water movement. If you should lose your balance or fall, ensure that you land in the water rather than on the board. If possible, continue to hold onto your paddle. Once you’ve recovered, repeat the aforementioned mounting tips. Once you’ve mastered standing on your paddle board, you can move on to learning a few strokes. The first stroke to master is the forward stroke. This is what propels you forward in the water. Hold the paddle in the vertical position on one side of your board. Submerge it in the water around the nose of your board and pull it back until it reaches your feet. Use the resistance of the water to move your board forward. Alternate this stroke between both sides of the board to reach your destination (too many strokes on one side will result in you slowly turning around). The reverse stroke resembles the forward stroke, only backward. To achieve a successful backward stroke, place the paddle in the water near the rear of your board. Slowly push forward on the water to turn or come to a full halt. The sweep stroke can be used to turn backward or forward. To perform the sweep stroke, imagine yourself drawing a c-shape (reverse c-shape on your right) from one end of your board to the other. As always, fully submerge your paddle. Bending your knees ever so slightly helps you to use less energy when performing this stroke. When you’re just getting starting learning how to stand-up paddle board, it’s always a good idea to use the buddy system. Having an extra set of eyes can help you perfect your strokes. It can also be a lifesaving insurance policy if something is to go wrong. It’s always a good idea to start SUPing in small increments. While paddle board workouts vary in intensity, it’s important not to travel to far or overexert yourself when water is involved. Keep your eye out for SUP yoga and fitness classes. Not only are these a fun way to perfect your SUP skills, but they are also a great way to maximize your time on board without overdoing it. Beginners often fall short of making efficient strokes. Whether your moving forward, backward, turning, or stopping, your paddle should always be fully submerged in the water. What’s more, ensure you are using your core, shoulder, and back muscles in addition to your arms. All too often, beginner boarders overtax their upper extremities. Paddleboarding requires you to hold your paddle with one hand on the top (the T-shaped grip) and the other at waist-height along the shaft. What’s more, don’t make the rookie mistake of facing your paddle with the slope facing you. We promise it works far better the other way around! For experienced boarders, there’s no time like the present to paddle board. However, beginners should note that adverse wind and weather can put a damper on their learning process. When you are just starting out, it’s a good idea to try your board in a lake, stream, or bay with minimal surf and low water levels. This way, if (more like when) you fall, you’ll waste less energy getting back up again. As noted above, SUP boarders outside traditional buoyed swimming and surf areas are considered small “vessels.” In such cases, they need to obey the navigation laws of the U.S. Coast Guard. In most bodies of water, this means bringing along all required safety equipment and understanding the meaning of buoys and beacons. These floating markers help identify waterway boundaries, hazards, and channels. Stand-up paddle boarding is one of the most enjoyable and fastest growing sports. In fact, it has come a long way since its Waikiki origins. Nowadays, people combine paddle boarding with other disciplines, such as yoga, fishing, and sightseeing. According to the Outdoor Foundation’s 2014 report, U.S. citizens took part in an estimated 13.7 million paddle board outings. These individuals cited getting exercise, being close to nature, and gaining self-confidence as just a few of factors that motivated them to do stand up paddleboarding. Are you interested in trying stand-up paddle boarding? We hope our tips and tricks provide the head start you need to get out and enjoy this thrilling water sport! How to Stand Up Paddle Board (SUP) Beginners Guide	Overall rating:	5	out of 5 based on 5	reviews.